Leather is everywhere this fall and now that our summer has unofficially come to an end with the passing of Labor Day, I can't get thoughts of leather out of my mind. I don't yet own a pair of leather pants, they're next on my wish list, but I did buy a couple pairs of coated jeans. They are a great alternative to leather pants whether you don't want the hefty price tag, the cleaning hassle, or you just don't enjoy wearing leather. Here I am wearing a pair of Citizens for Humanity coated jeans. I love how they are a heavier weight jean making them look more like a real leather pant. I decided to style them with a black tank and metal jewelry making the whole look a bit rocker chic. I finished it off with a cobalt blue silk blazer for a pop of color. 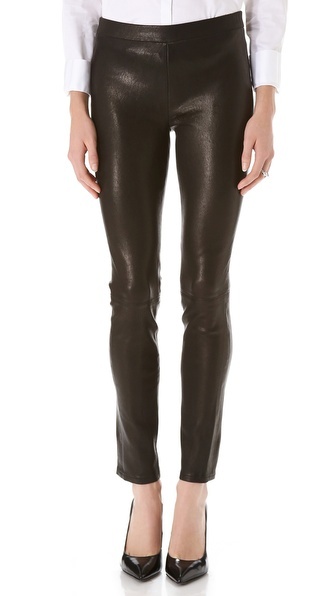 If you're looking for the perfect leather leggings this season, I suggest this pair by J Brand. The fit is flattering and the price is right for a great quality leather, which is hard to find under $1000. You can get them at National Jean Company 617-969-2888. They will hopefully be in my closet soon! !